Keepthinking | Content/Collection Management System & Digital Design for Museums | London & New York | News | Manage your assets. Package your objects. Qi was already born with the ability to manage digital assets in a native way, including images, documents and multimedia files (audio and video): the "Media Library" was the integrated repository of all things binary. The Media Library, though, was not incredibly sophisticated. It allowed uploading and linking of digital assets and had a single tier of permissions: either users could see it and use it in full, or they could not. That's why we never really called it a "Digital Assets Management" as we knew we would have had to do some extra work to achieve that. And that is what we did over the last few months, so we can now proudly say that Qi integrates a fully fledged, state-of-the-art DAM. Let's see what it includes. Catalogues add a new dimension to managing media assets. 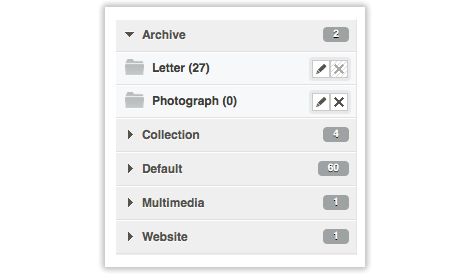 The Media Library can now be split into one or more Catalogues, which in turn can have folders and sub folder. 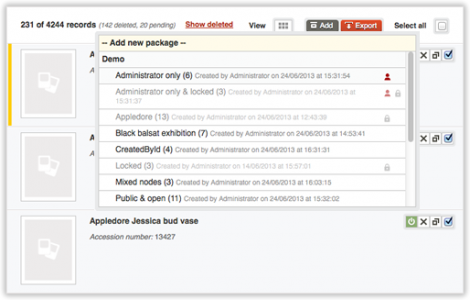 Each Catalogue can have different permissions, linked to teams. So for instance the Collections Management team may have full editing permissions on the collection images and assets, while the web team can use them (for the website or newsletter) without the possibility to modify them. It is also possible to specify up to what size the read-only option allows editors to use images, from tiny versions up to the source files. Media files are not all the same. While images are relatively simple and they have a life of their own, we believe that other types of files would better be cross related. 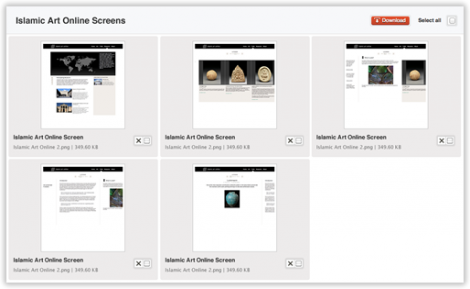 Documents, for instance, would greatly benefit from having links to images, so that the PDF of the exhibition catalogue you just uploaded could feature the cover of the same catalogue as a placeholder for the website. 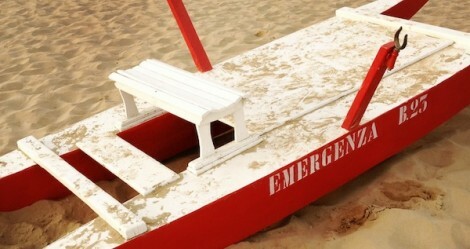 Audio and Video can have a cover image, but also one or more subtitles (multiple languages) and related documents (e.g. transcripts). This is all possible. Since we were at work on the media part, we decided to enhance a few other things. One of them included replacing the previous Flash uploader with a new HTML5 one (so now Qi is 100% HTML5). 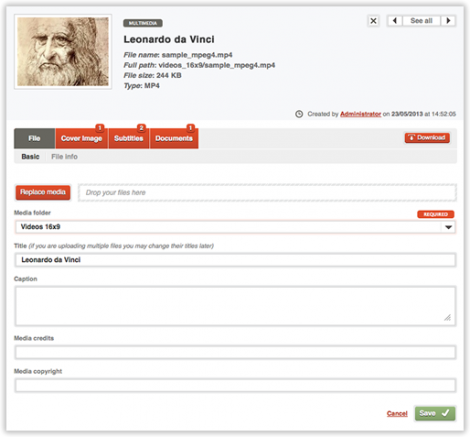 The new uploader includes the possibility to do batch uploads of files, via drag-and-drop. So now you can create multiple media assets simply by dragging files onto the relevant place on Qi and let the interface do the rest. Similarly, you may now select one or more media files for batch download, in the size you need. Simply tick the box next to each asset and select "Download" for the size you need. You will receive a ZIP file with the selected assets straight into your download folder: Powerpoint presentation solved. Each package can be public or private, as well as locked or open. 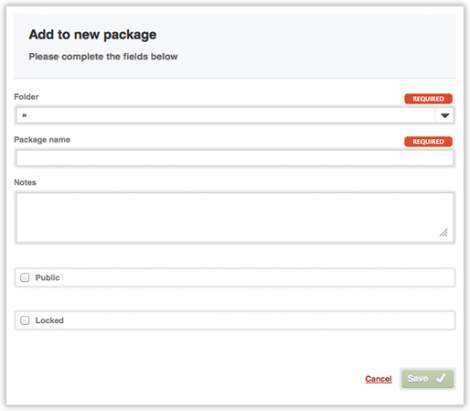 Adding records to an exiting package or creating a new package based on a selection is also extremely simple. 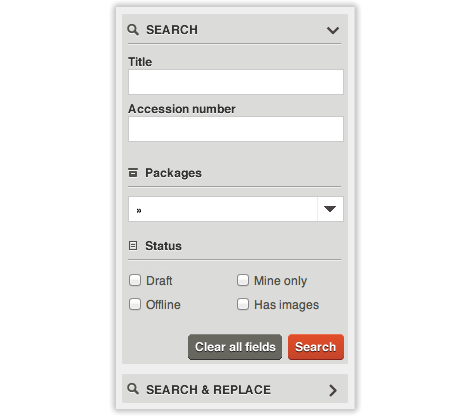 Finally, packages are part of the standard search interface, so you can combine the usual searches with package information (e.g. find all the Picassos within the Exhibition planned for next month). Qi 5.3 had us working on 103 issues. This is the list of the most significant bugs that have been fixed with the current release.